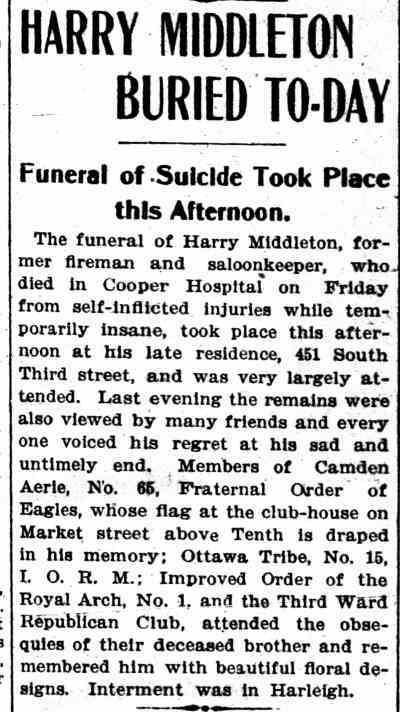 HARRY B. MIDDLETON was the son of prominent Camden undertaker Frank P. Middleton, who In 1869 Mr. Middleton established himself in Camden as an undertaker and speedily acquired an extended patronage. 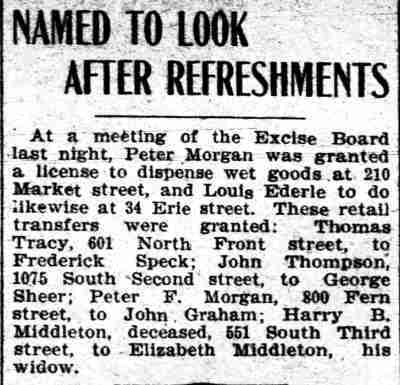 By 1883 he was located at 319 Market Street, where he remained into the early 1900s. 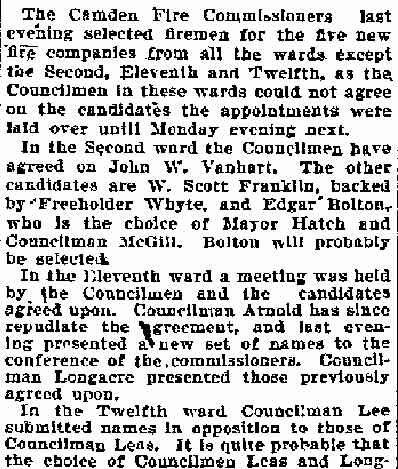 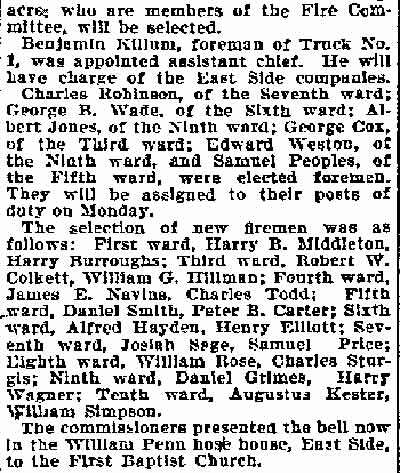 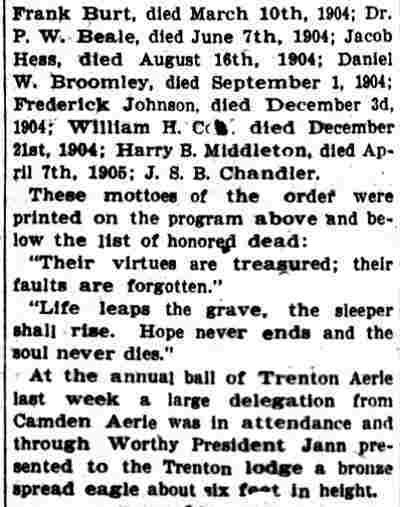 His grandfather, Bowman H. Middleton, had also been an undertaker and had served as Camden County coroner for a number of years. 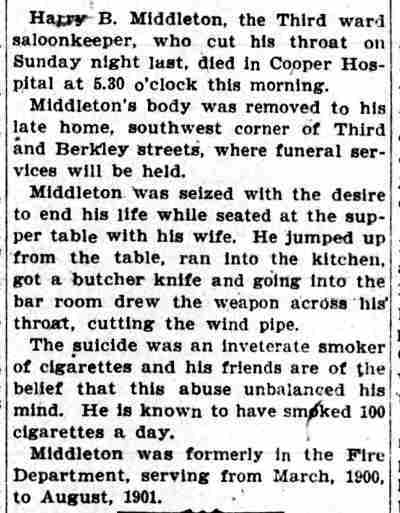 Tragedy struck the Middleton family again on September 27, 1895, when Harry Middleton's uncle, Josiah V. Middleton, who also worked as an undertaker, committed suicide by hanging himself in his coffin shop. 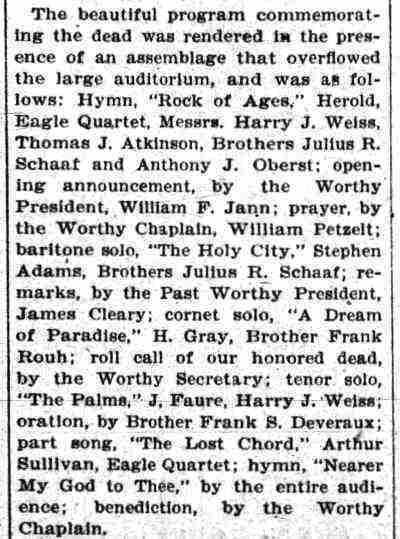 Stricken by paralysis two years previously, he was despondent over his illness. 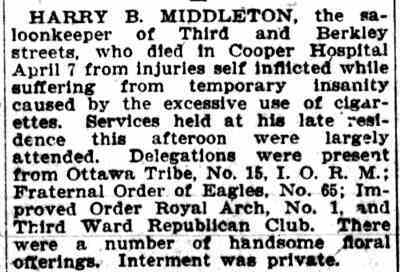 Harry Middleton was was still living with his then widowed-father and sister Mattie at 319 Market Street when the Census was taken in 1900. 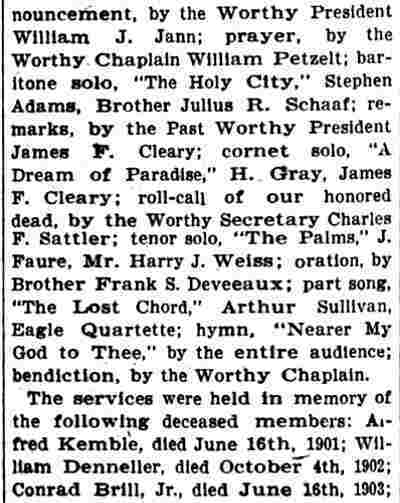 His father passed away shortly afterwards. 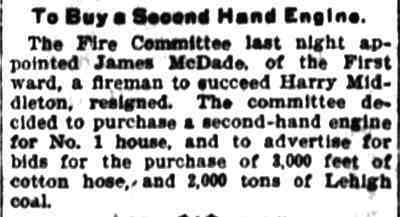 Harry B. Middleton, had been appointed to the Camden Fire Department at the end of 1899. 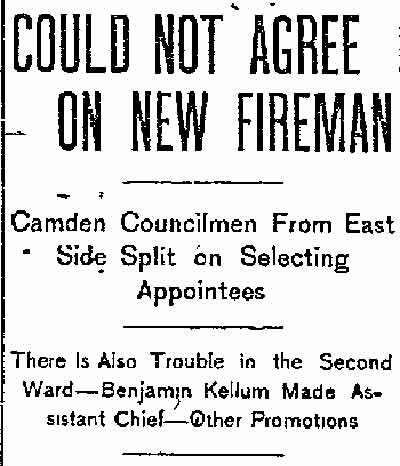 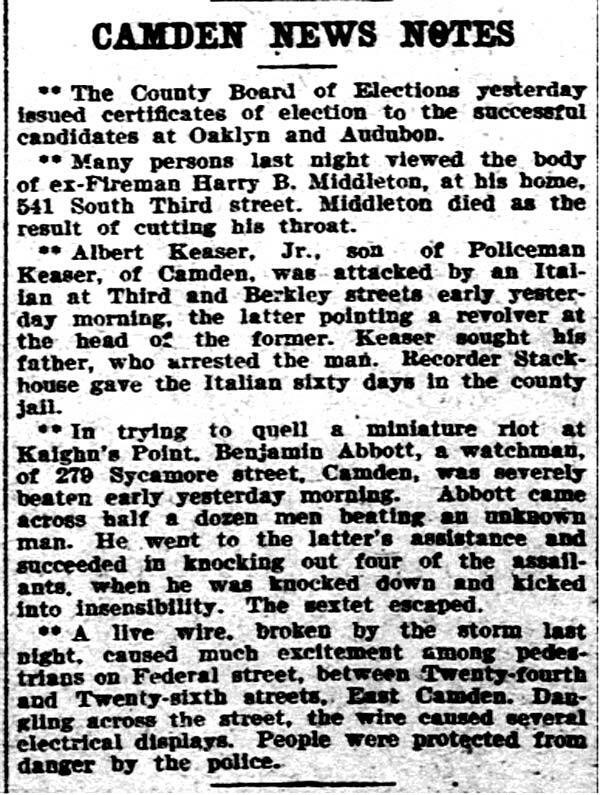 He served briefly as a Camden firefighter, leaving the department in July of 1901. 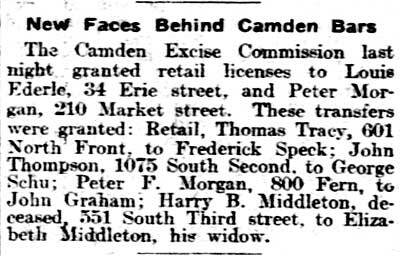 He then went into the saloon business at 451 South 3rd Street, a location that had previously been operated by Camden policeman Isaac Toy and Toy's father-in-law, John W. Elliott. 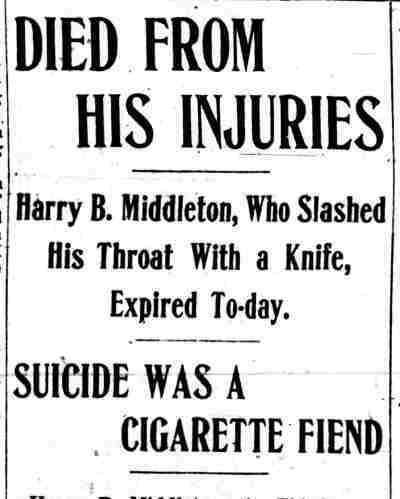 Sadly, in April of 1905, like his uncle Josiah, Harry B. Middleton took his own life. 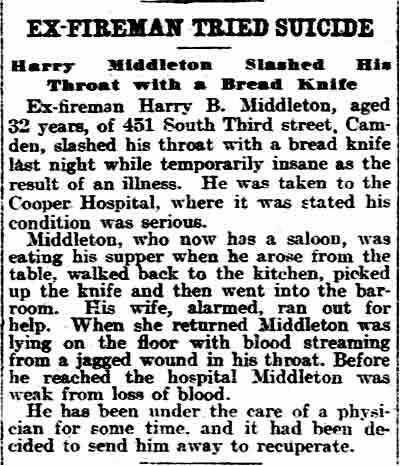 His wife, Elizabeth J. Middleton, took over operation of the saloon and remained in business at that location though at least 1914. 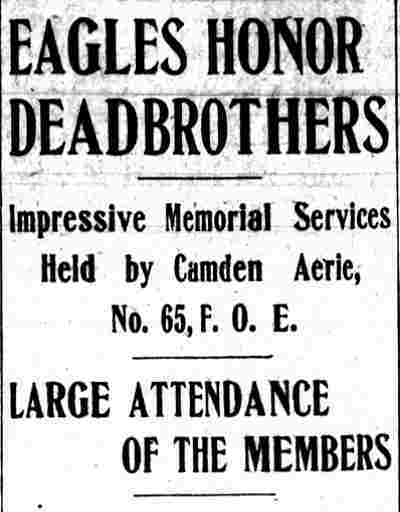 Camden Aerie No. 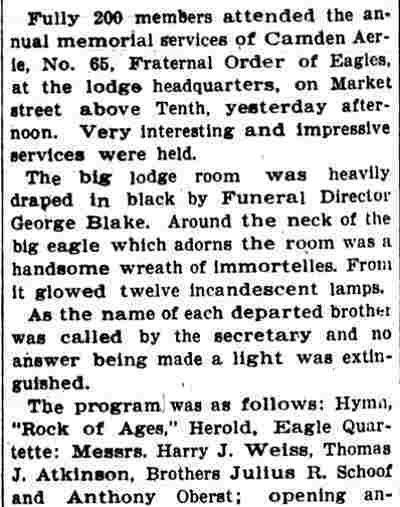 65, Fraternal Order of Eagles - Alfred Kemble - William Denneler - Conrad Brill Jr.